We are proud to introduce ourselves as one of the reputed manufacturers and suppliers of a wide range of Bathroom Showers. Owing to excellent finish and attractive designs, these showers are extensively praised by large number of clients. Owing to unmatched quality, dimensional accuracy and break free performance, our Classic Showers are widely demanded by large number of clients. 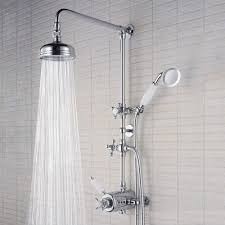 We offer Classic Showers in various attractive designs and patterns. Established in the year 2010, Gautham Ceramics are one of the renowned names in industry engaged in the business of ceramics products and their installation service. With its units based in Bengaluru, Karnataka (India) our company operates all its business activities as a Sole Proprietary concern since its foundation. Company is one of the trustworthy traders, wholesaler, retailer, dealer, distributor and suppliers of products such as Ceramic Tile, Bathroom Tile, Natural Stone, Water Tap, Kitchen Sink and many more. We are also engaged in providing Installation Service to our customers. We have reached a reputed position in this dominion as for the obtainability of best ceramic products for valued clients. Furthermore, our employees work in close coordination with each other to complete the organizational goals within the committed period. Along with, easy dealings and reasonable cost, we have made a huge cliental base across the national marketplace.